The majority of the Earth's atmosphere is composed of a mixture of only a few gases-nitrogen, oxygen, and argon; combined these three gases comprise more than 99.5% of all the gas molecules in the atmosphere. These gases which are most abundant within the atmosphere exhibit almost no effect on warming the earth and its atmosphere since they do not absorb visible or infrared radiation. However, there are minor gases which comprise only a small portion of the atmosphere (about 0.43% of all air molecules, most of which are water vapor at 0.39%) that do absorb infrared radiation. 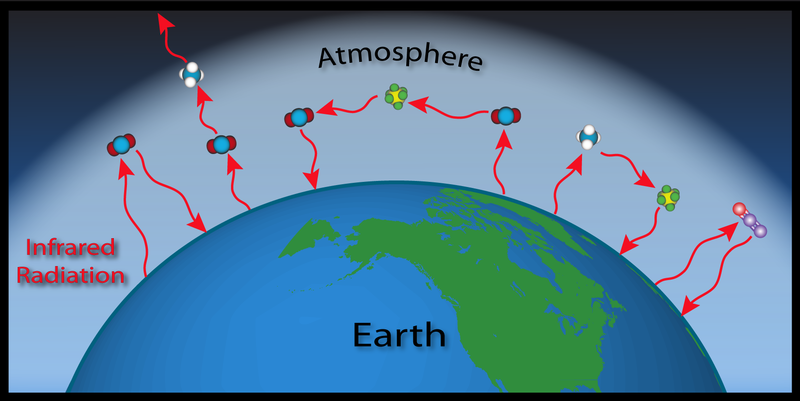 These "trace" gases contribute substantially to warming of the Earth's surface and atmosphere due to their abilities to contain the infrared radiation emitted by the Earth (see below for details on the Greenhouse Effect). Since these trace gases influence the Earth in a manner somewhat similar to a greenhouse, they are referred to as GreenHouse Gases, or GHGs. Water vapor is the most important GHG, since globally it is the most abundant of these gases, although it varies from 0-3% in a given location. NOAA's Carbon Cycle Greenhouse Gases (CCGG) group is concerned with the abundances of many of the other GHGs, since humans have a dominant role in the growing atmospheric concentrations of these gases. The gases measured by the CCGG include carbon dioxide (the second most important GHG), methane, nitrous oxide, sulfur hexafluoride, ozone, and a few others. While these gases constitute only a tiny fraction of Earth's very large atmosphere, their amounts are sufficient to absorb a major fraction of the infrared light in the atmosphere. Carbon Dioxide (CO2) is a colorless, odorless gas consisting of molecules made up of two oxygen atoms and one carbon atom. Carbon dioxide is produced when an organic carbon compound (such as wood) or fossilized organic matter, (such as coal, oil, or natural gas) is burned in the presence of oxygen. 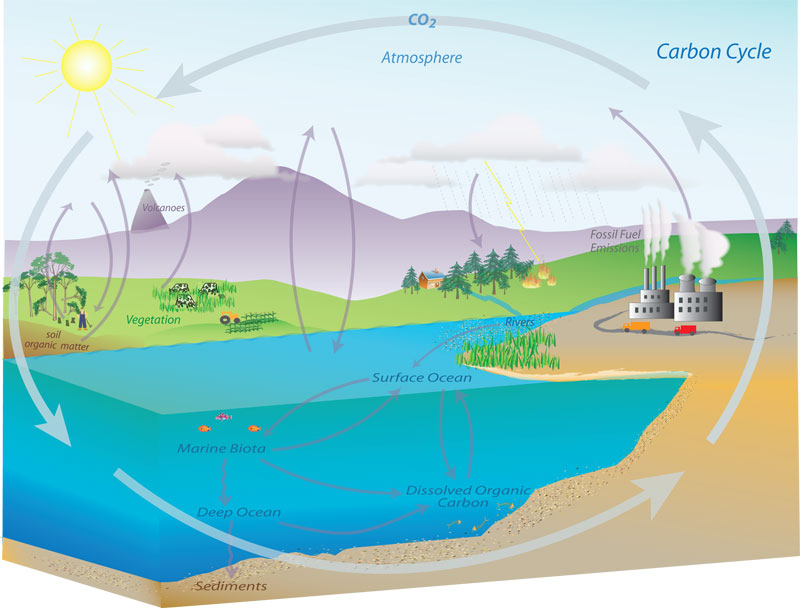 Carbon dioxide is removed from the atmosphere by carbon dioxide "sinks", such as absorption by seawater and photosynthesis by ocean-dwelling plankton and land plants, including forests and grasslands. However, seawater is also a source, of CO2 to the atmosphere, along with land plants, animals, and soils, when CO2 is released during respiration. 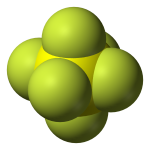 Methane (CH4) is a colorless, odorless non-toxic gas consisting of molecules made up of four hydrogen atoms and one carbon atom. Methane is combustible, and it is the main constituent of natural gas-a fossil fuel. Methane is released when organic matter decomposes in low oxygen environments. Natural sources include wetlands, swamps and marshes, termites, and oceans. Human sources include the mining of fossil fuels and transportation of natural gas, digestive processes in ruminant animals such as cattle, rice paddies and the buried waste in landfills. Most methane is broken down in the atmosphere by reacting with small very reactive molecules called hydroxyl (OH) radicals. Nitrous oxide (N2O) is a colorless, non-flammable gas with a sweetish odor, commonly known as "laughing gas", and sometimes used as an anesthetic. 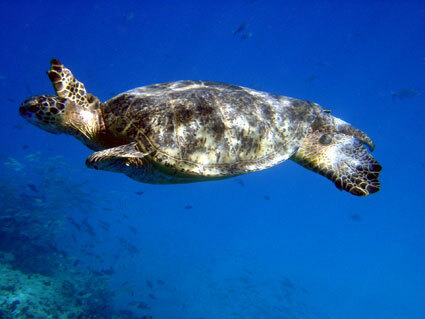 Nitrous oxide is naturally produced in the oceans and in rainforests. Man-made sources of nitrous oxide include the use of fertilizers in agriculture, nylon and nitric acid production, cars with catalytic converters and the burning of organic matter. Nitrous oxide is broken down in the atmosphere by chemical reactions driven by sunlight. Sulfur hexafluoride (SF6) is an extremely potent greenhouse gas. SF6 is very persistent, with an atmospheric lifetime of more than a thousand years. Thus, a relatively small amount of SF6 can have a significant long-term impact on global climate change. SF6 is human-made, and the primary user of SF6 is the electric power industry. Because of its inertness and dielectric properties, it is the industry's preferred gas for electrical insulation, current interruption, and arc quenching (to prevent fires) in the transmission and distribution of electricity. SF6 is used extensively in high voltage circuit breakers and switchgear, and in the magnesium metal casting industry. 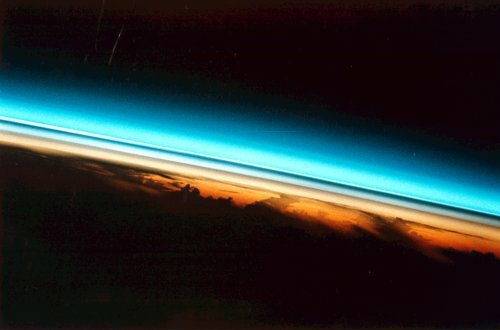 Many of the atmospheric trace gases, despite their relatively minor abundances, have a significant influence on Earth's climate, due to a phenomenon called the "Greenhouse Effect". The Sun ultimately drives Earth's climate by emitting energy in the form of sunlight. Sunlight is solar radiation mostly in the form of visible and a smaller portion as ultraviolet (UV) energy. This is also called shortwave radiation. 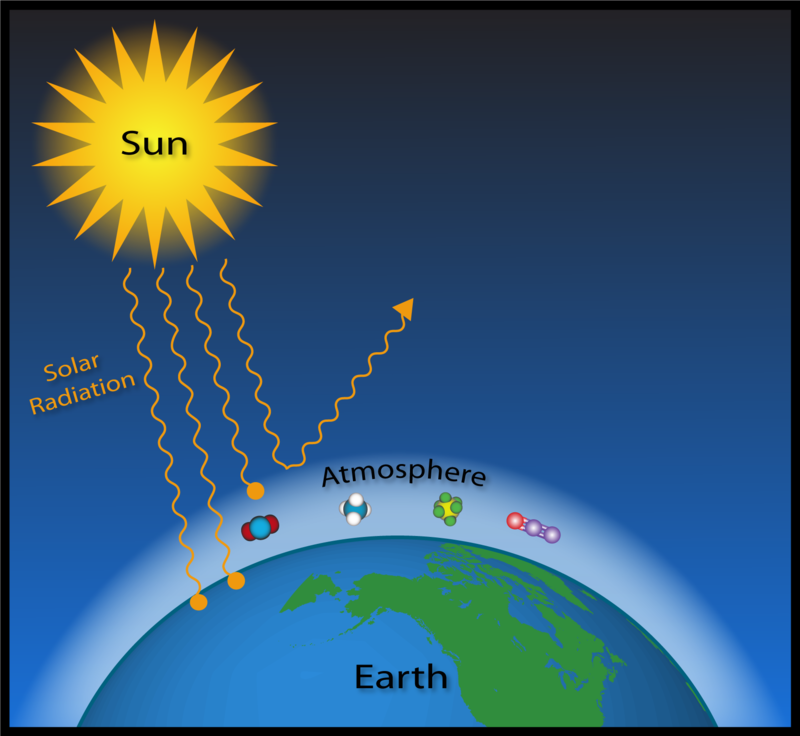 Clouds and the Earth's surface reflect some of this incoming solar radiation back out to space (approximately 30%), some (mostly UV) is absorbed by the atmosphere (about 20%), and the remaining half is absorbed at the Earth's surface. Sunlight absorbed by Earth's surface acts to warm the surface. The solar energy that has been absorbed by Earth's surface is then emitted in a different form. Since Earth is much cooler than the Sun, it emits weaker radiation with longer wavelengths, in the infrared range. Some of this infrared radiation passes through the atmosphere unimpeded, but the majority is absorbed by GHGs and then reemitted in all directions-towards space, to other GHG molecules, and back to Earth's surface. In this way, GHGs block most of the infrared radiation within the atmosphere that would otherwise escape directly into space. This process is naturally occurring and beneficial, as it maintains favorable living conditions for Earth's microbial, animal and plant inhabitants. The global average temperature is 14°C (57°F), which is approximately 33°C (59°F) warmer than temperatures would be without an atmosphere and GHGs. 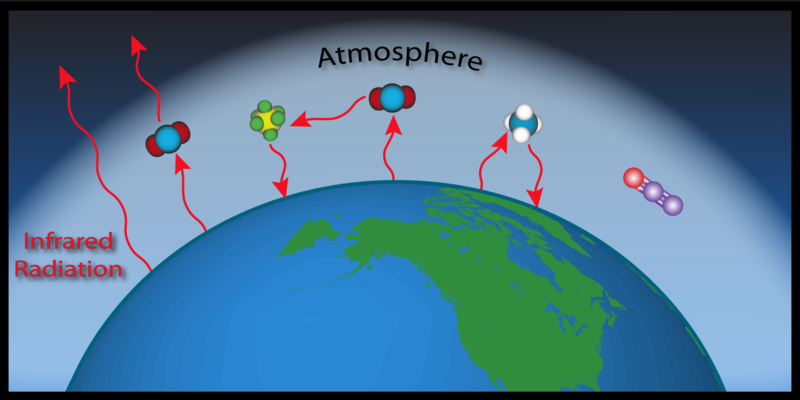 Due to their ability to absorb infrared radiation, GHG molecules have a significant impact on Earth's climate by acting as a barrier for escaping "heat". For over a century, scientists have realized that concentrations of atmospheric gases may significantly affect Earth's climate through this process. 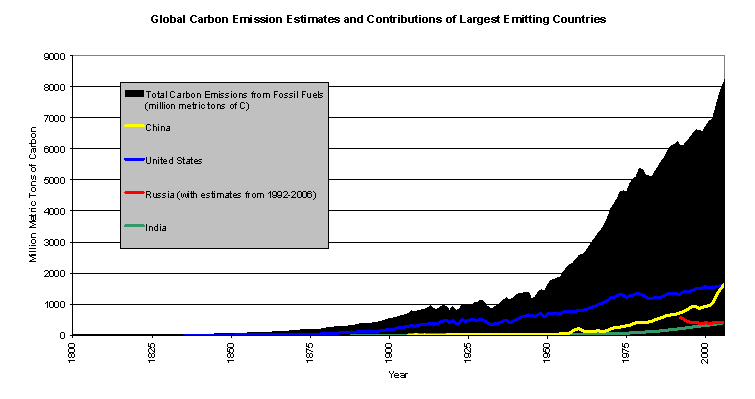 Scientists have been measuring GHGs in the atmosphere for more than 50 years. Charles Keeling began continuous measurements of CO2 concentrations in 1958 and others, including NOAA scientists, followed shortly thereafter. Today, there is unequivocal scientific evidence that the abundance of these gases is increasing in the atmosphere. Evidence includes decades of carefully calibrated, global measurements of these trace gases, combined with measurements of "old" air preserved in bubbles embedded in ice cores and measurements of carbon isotopes, in tree rings (from which past atmospheric CO2 can be reconstructed). This increase in atmospheric GHGs has a significant impact on Earth's climate because Earth's incoming and outgoing radiation is out of balance --which forces the climate to change. As the concentrations of GHGs increase within the atmosphere, more infrared radiation is absorbed and less escapes directly to space, resulting in amplified warming. This is called the Enhanced Greenhouse Effect. Note: This atmospheric process is referred to as the Greenhouse Effect, since both the atmosphere and a greenhouse act in a manner which retains energy as heat. However, this is an imperfect analogy. A greenhouse works primarily by preventing warm air (warmed by incoming solar radiation) close to the ground from rising due to convection, whereas the atmospheric Greenhouse Effect works by preventing infrared radiation loss to space. Despite this subtle difference, we refer to this atmospheric process as the Greenhouse Effect and these gases as Greenhouse Gases because of their role in warming the Earth. Of the GHGs, CO2 is of greatest concern because it contributes the most to the Enhanced Greenhouse Effect and climate change. For this reason, scientists (at NOAA and elsewhere) have been studying this molecule carefully and attempting to quantify its abundance in the atmosphere and track how and why it changes. The CO2 molecule is involved in a complex series of processes called the carbon cycle, where the carbon atom within the molecule moves between many different natural reservoirs. 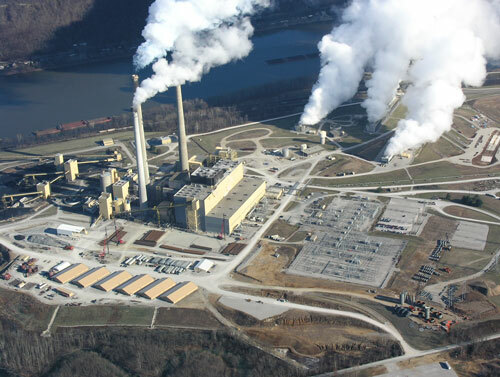 As carbon is transferred between reservoirs, processes which release CO2 into the atmosphere are called sources, and processes which remove CO2 from the atmosphere are called sinks. Carbon is continuously exchanged and recycled among the reservoirs through natural processes. These processes occur at various rates ranging from short-term fluctuations which occur daily and seasonally to very long-term cycles which occur over hundreds of millions of years. For example, there is a clear seasonal cycle in atmospheric CO2 as plants photosynthesize during the growing season, removing large amounts of CO2. Respiration (from both plants and animals) and decomposition of leaves, roots, and organic compounds release CO2 back into the atmosphere. On a scale spanning decades to centuries, CO2 levels fluctuate gradually between the ocean and atmospheric reservoirs as ocean mixing occurs (between surface and deep waters) and the surface waters exchange CO2 with the atmosphere. Much longer cycles also occur, on the scale of geologic time, due to the deposition and weathering of carbonate and silicate rock. Carbonate rocks like limestone are formed from the shells of marine organisms buried on the ocean floor, and they are chemically eroded by reaction with CO2 (remember that CO2 mixed with water is an acid) in the air and in soils. Silicate rock reacts with carbonate rock deep underground, producing CO2 gas coming out of volcanoes. Fossil fuels form a relatively small part of these natural geologic cycles. At time scales of most interest to humans (years to decades to centuries) the atmosphere exchanges carbon with three main reservoirs: the terrestrial biosphere, the oceans, and fossil fuels. The terrestrial biosphere defines the part of the earth system that supports organisms living on land, and includes plants, animals, soil microbes, and decomposing organic material. Since carbon is a main component of organic molecules that are the building blocks for all life, a large amount of organic material is stored in the terrestrial biosphere-it is one of the main reservoirs for carbon. In addition, there is a large amount of carbon exchanged seasonally between the terrestrial biosphere and the atmosphere. Surface exchanges (or "fluxes" ) result from organisms living within the terrestrial biosphere, and they naturally include both sources and sinks. Some of the terrestrial biosphere's major sources of atmospheric CO2 include respiration by land biota (plants, animals, microorganisms, humans, etc) and the burning and decomposition of organic material. 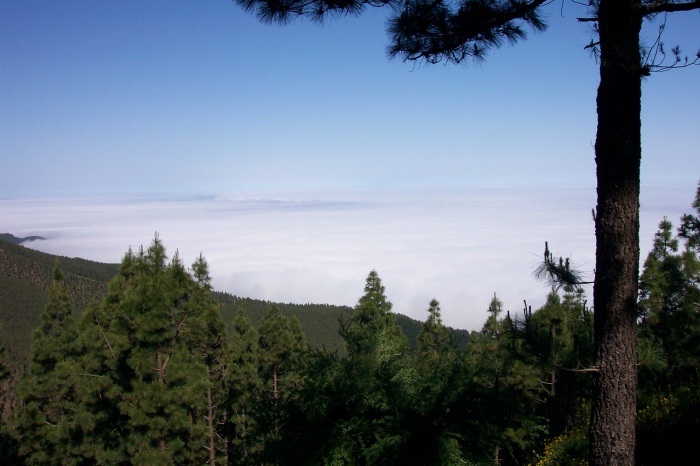 The removal of atmospheric CO2 by the terrestrial biosphere occurs through photosynthesis. Plants use CO2 from the atmosphere to build food in the form of organic matter--which in turn becomes food for microbes, fungi, insects, and higher organisms. Human activities have a considerable impact on the terrestrial biosphere's ability to remove or emit carbon dioxide through practices such as deforestation and other forms of land management. The oceans continuously exchange CO2 with the atmosphere. Due to the large surface area of the oceans and the high solubility of carbon dioxide in water (which creates carbonic acid ), the oceans store very large amounts of carbon - about 50 times more than is in the atmosphere or terrestrial biosphere. Each year, some of that carbon is released to the atmosphere, and a similar amount is taken back up into the oceans (although the two processes might occur in different parts of the world's oceans). In addition, organisms within the marine biosphere photosynthesize and respire CO2. Due to the slow rate of mixing between surface and deep ocean waters, only the surface waters are responsible for short-term changes of atmospheric CO2. As the atmospheric CO2 concentration increases, the ocean sink also increases slightly. The oceans will eventually absorb the majority of the CO2 released from human activities, but this will take thousands of years. CO2 in the form of carbonic acid is a weak acid, and there are profound implications on marine ecosystems due to the increasing acidity of the oceans. Over the course of millions of years, as biomass from dead plants and microorganisms accumulated in sediments and was subjected to high temperature and pressure deep below Earth's surface, organic remains from the biosphere (both terrestrial and marine) have been converted to fossil fuels (coal, oil, and natural gas). However, since the beginning of the Industrial Revolution in the 1800s, humans have been burning these fossil fuels, releasing the carbon from them back into the atmosphere as CO2. Processes that took millions of years to remove carbon from the biosphere have been reversed so that the same carbon is being released at unprecedented rates as a result of human activities. Atmospheric CO2 levels have increased 38% [as of 2009] since Preindustrial times and are higher than at any time in the past 800,000 years. Currently, atmospheric CO2 levels continue to rise at an accelerating rate as humans burn fossil fuels at increasing rates. In human terms, the CO2 emitted by the combustion of fossil fuels (along with cement manufacturing and other human activities) remains "forever" due to the stability and longevity of CO2 within the atmosphere and oceans. This will have significant implications on the Earth System, as the resulting radiation imbalance from the Enhanced Greenhouse Effect will noticeably alter the global climate for centuries to millennia. Source: Boden, T.A., G. Marland, and R.J. Andres. 2009. U.S. Department of Energy, Oak Ridge, Tenn., U.S.A.